Construction – Septic tanks are made of precast concrete, fiberglass or plastic and come in a variety of shapes and sizes. 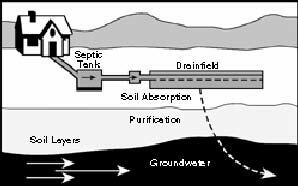 Function – The main function of the septic tank is to collect household wastewater-water from the toilet (blackwater) and water from the bathtub, showers, sinks, and laundry (grey water). The septic tank treats the wastewater naturally by holding it in the tank long enough for solids and liquids to separate. Process – Household wastewater flows from the home to the septic tank through a building sewer. A baffle or T-shaped pipe slows and directs the flow of water downward. The wastewater is then retained for a day or more in the tank forming three distinct layers: scum, liquid and sludge. Scum layer: This top layer contains solids lighter than water – such as greases, oils, fats, and materials like toilet paper – that float in the tank. Liquid layer: This middle layer contains water, dissolved materials, and small amounts of suspended solids. This water flows to the secondary treatment device. 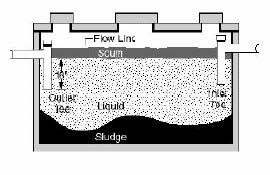 Sludge layer: This bottom layer contains solids heavier than water. While effluent leaves the tank, the scum and sludge layers remain. Bacteria found naturally in the wastewater work to break down these layers. Organic matter is broken down anaerobically (without oxygen). Gases produced are vented back through the building sewer and released through a plumbing vent on the roof. The remaining scum and sludge must eventually be pumped from the tank. Water conservation is important because continual soil saturation can affect soil quality and its ability to naturally remove toxins and other pollutants from wastewater. Immediately repair leaking faucets or running toilets, and use dishwashers only when full. Space out activities requiring heavy water use (like laundry) over several days. Divert roof drains, surface water and sump pumps away from the drainfield. Never use your septic system to dispose of hazardous household chemicals. Small amounts of paints, varnishes, thinners, waste oil, photographic solutions, pesticides, antibiotic drugs and other organic chemicals can destroy helpful bacteria and biological digestion within your system. Never dispose of anything in your tank that can easily be put in the trash. Remember, your septic tank is not a garbage disposal. Solids build up in the tank and will eventually need to be pumped out. Protect your septic system from potential damage. Plant only grass near your septic system – roots from shrubs and trees can cause damage. Don’t allow heavy machinery over any part of the system. Never build anything over the drainfield. Pumping your septic tank is the single most important thing you can do to protect your system. If the buildup of solids in the tank becomes too high, solids move to the drainfield and can clog and strain the system to the point where a new drainfield will be needed. Permission granted by The National Small Flow Clearinghouse, Pipeline Newsletter. For more information, contact the Water Quality Division at 513.946.7966, or visit www.hamiltoncountyhealth.org.